This week kicked off the first week of the 31st Alaska Legislature. There was no shortage of drama in Juneau. If this week is any indication of how things will go this session, it is sure to be quite loose. I was in Juneau this week to see the session get underway and let me tell you, there is a LOT to see down there. I forgot to add. When I was in Juneau I stayed at the Silverbow Inn. It’s a great hotel located right in the center of Downtown Juneau. It’s also only a short walk to the Capitol. The owners and staff were very friendly. If you are looking for a place in Juneau I strongly recommend the Silverbow! A friendly message and reminder to all our readers, the Landmine is made possible by myself and a team of awesome Alaskans. It takes a lot of work to provide the content we do. We don’t have any financial backers. We do sell ads but this only provides limited income. If you enjoy the content we provide, please consider making a one time or recurring monthly donation. You can click here to donate via PayPal. We would really appreciate it! Things got off to a rough start in the House. In fact, there is still no organization. Negotiations are ongoing. There are rumors that there may be some kind of deal on a bi-partisan coalition but that has been the case for a while. If there is not an organization in House this week don’t expect one anytime soon. Until an organization is formed and a Speaker is chosen, there will be no committee assignments or meetings. There was a pinning ceremony on Monday (1/14/2019) night for newly elected legislators. Well, there was supposed to be. Because there was no Speaker the pinning part did not happen. However, there was some great food! Senator Cathy Giessel (R – Anchorage) addressed a packed room of new legislators, their families, and staff. She encouraged new legislators to work hard and said she was new once too. Representative Neal Foster (D – Nome) was elected Speaker pro tempore, but not before things got extremely loose in the House. 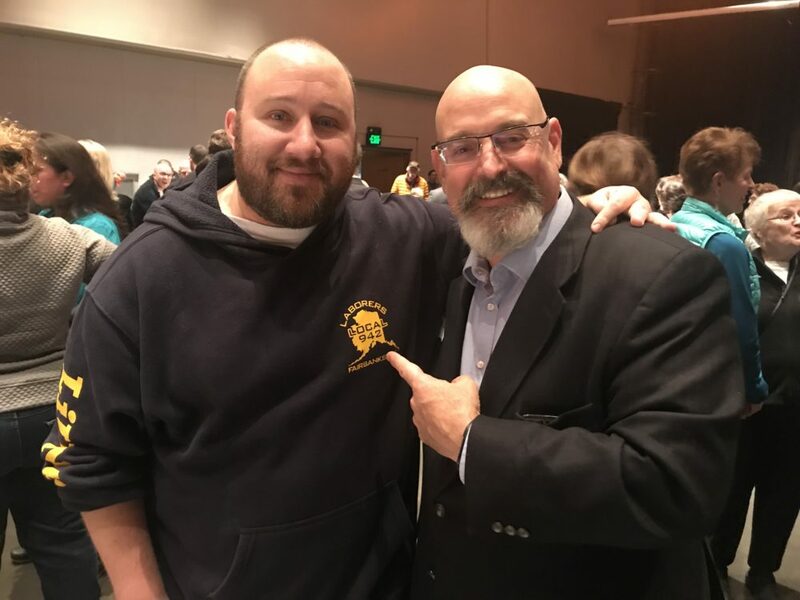 Lieutenant Governor Kevin Meyer (R – Alaska) attempted a maneuver he told me, and many others, he did not have the authority to do. He tried to transmit a message from Governor Michael J. Dunleavy (R – Alaska) directly to House Republicans in order to confirm Sharon Jackson for District 13. Representative Chris Tuck (D – Anchorage) objected, citing he had no authority to do that. From there it got pretty chaotic in the House. Eventually Meyer adjourned the meeting. See more on this in the Loose Unit section. The Senate got underway in normal fashion. After Senator John Coghill (R – North Pole) was elected President pro tempore, Senator Cathy Giessel was elected Senate President. You know newly elected Senators Scott Kawasaki (D – Fairbanks) and Chris Birch (R – Anchorage) were happy as hell they aren’t part of that mess in the House. There are a ton of new staffers in Juneau. Many of the veteran staffers and lobbyists have no idea who they are. If they spent any time on Facebook they would be able to recognize a lot of them. Many of them are well known trolls and provocateurs. One of Representative Josh Revak’s (R – Anchorage) staffers, Sergej Michaud, has been confused for a Russian mobster by many in the Capitol. Don’t worry, folks. He served with Revak in the Army. Another staffer, Parker Haymans, has also made quite the impression. And not a positive one. He is a staffer to newly elected Representative Sara Rasmussen (R -Anchorage). Let’s just say he needs to work on his people skills. You may remember his father as the very aggressive guy who was screaming “Idiot!” at me after we interviewed Mead Treadwell at Election Central for the primary. I won’t even say what he told me after, when the camera was off. I guess the apple doesn’t fall too far from the tree. Want to see what a Mead supporter looks like when he gets triggered by Jeff Landfield? Watch this. This was right after the Mead Meltdown. There were fundraisers for Republicans and Democrats held on Monday night before the session started. Legislators are prohibited from fundraising during session. The Democrats were at the Museum. The Republicans were at the Hangar. I stopped by the Republican one. It was packed and a lot of fun. I actually ran into everyone’s favorite conservative Jim Minnery at the bar. We were on the same flight to Juneau. I guess we were meant to meet. However, I was not welcomed by everyone. Apparently Buddy Whitt, staff to Senator Shelley Hughes (R – Palmer), literally tried to have me physically removed from the event. Luckily the Republican Women in Juneau don’t share his thug mentality. Hey Buddy, you should check my voter registration. Come at me bro? Governor Michael J. Dunleavy unveiled his PFD payback plan this week. The proposal is not a one time repayment, but a gradual repayment over three years. You can read his press release here. Basically if you qualify this year, and also qualified in 2016 you will get this year’s amount, currently proposed at $3,000, plus an extra $1,061 for 2016. This would be the same for the next two years corresponding with the 2017 and 2018 dividends. Some wonder if the plan violates Zobel V. Williams, a U.S. Supreme Court decision from 1980 that says the State can’t treat people differently based on residency for a dividend. This is based on the Equal Protection Clause in the 14th Amendment. There will likely be a lawsuit if the plan is approved. The plan is a good idea though. Rather than force the legislature to make a massive appropriation this year, they can make three smaller ones over the next three years. This is more palatable to many legislators who don’t think we should be draining billions out of the earnings reserve. And if the courts were to rule it unconstitutional, Dunleavy can just blame them. Genius! Although I’m not sure the folks expecting the payback will buy it. Governor Michael J. Dunleavy was busy appointing people to boards and commissions this week. I’m still waiting for my appointment… Edie Grunwald, former candidate for lieutenant governor, was appointed chair of the Parole Board. If you are up for parole in the next four years, don’t pack your stuff just yet. Albert Fogle, who was on the receiving end of the shameful attack by Riggs, was appointed to the Alaska Industrial Development and Export Authority (AIDEA) and Alaska Energy Authority (AEA) board. Fogle just took the job as Vice President of the Alaska State Chamber of Commerce. The appointment is interesting because word is his boss at the Chamber, Curtis Thayer, is about to be appointed Executive Director of the Alaska Energy Authority. The board meets on Tuesday. Looks like Fogle might be President of the Chamber real soon! It looks like Brandon Emmett was not reappointed to the Marijuana Control Board. He’s an industry member from Fairbanks and was one of the original members. No word on who his replacement will be. Look for the person to be named this week. Oh boy. 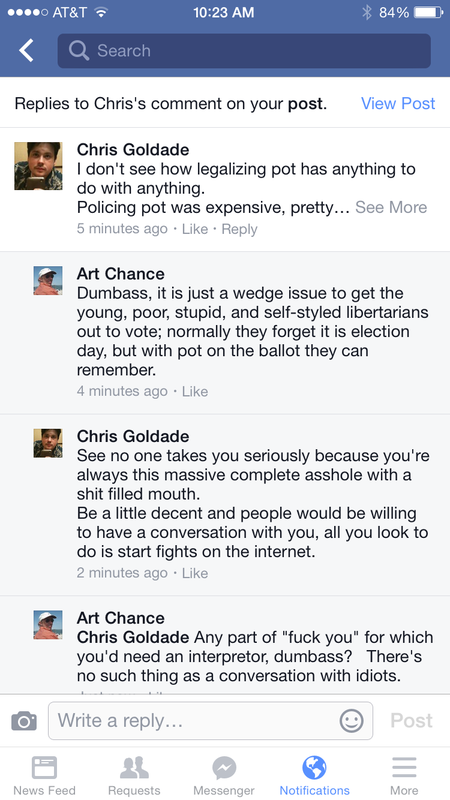 It looks like Art Chance was hired by the Department of Administration in some kind labor relations position. For a guy who rails about state employees and double dipping, he’s sure not one to practice what he preaches. And let’s not forget about his horrible demeanor. This guy is as loose as it gets. Brooke Ivy was hired by the Alaska Oil and Gas Association (AOGA) as their new External Affairs Manager. Ivy previously worked as staff to former Representative Jason Grenn and before that Senator Bill Wielechowski (D – Anchorage). The irony is not lost that a former Wielechowski staffer is now working for AOGA. 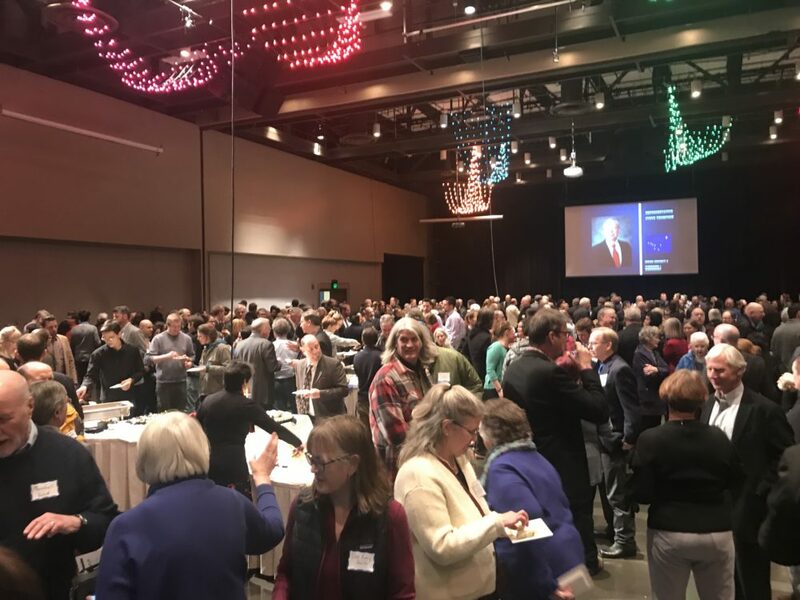 The City of Juneau welcomed everyone back to Juneau with a big reception at Centennial Hall on Wednesday (1/16/2019) night. It was an absolute packed event with legislators, staff, the governor, state employees, and Juneau residents. I even ran into my buddy Vinny the Union Boss! There is an over/under bet in the Capitol for how long Tuckerman Babcock will last as Chief of Staff to Governor Michael J. Dunleavy. Someone was overheard saying. “Uh, I’ll take the under.” And speaking of Tuckerman Babcock, I have some great news. I’m happy to announce that Mr. Babcock is the 2018 Loose Unit of the year! Thanks to everyone who voted. Tuckerman, you will be receiving your plaque soon. This is one of those slam dunk weeks. This week’s Loose Unit is Representative Sharon Jackson (R – Eagle River). If you have not been following the legislature this week you really missed out. Allow me to tell you about just how loose it got. Jackson was appointed by Dunleavy to take the place of Nancy Dahlstrom, who Dunleavy appointed as Corrections Commissioner. That whole situation was in itself pretty loose. But that’s another story. The issue with Jackson’s appointment is there is no organization in the House. 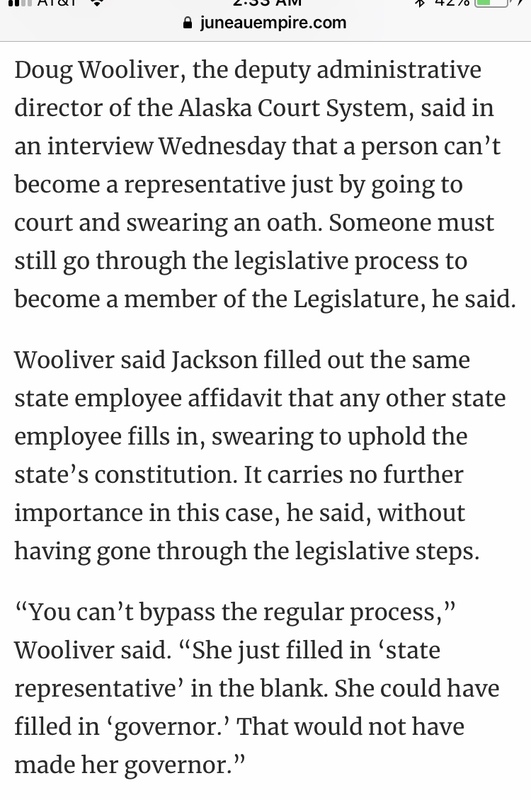 This meant there was going to be an issue with the message from the governor, informing the House that he appointed Jackson to the seat, being accepted by the House. She would need to be confirmed by a majority vote of House Republicans to be seated. Lieutenant Governor Kevin Meyer attempted to transmit the message directly to House Republicans, even after he said he did not have the power to do that. Democrats objected, citing his lack of authority based on the rules. His attempt was eventually prevented and the House adjourned. A message from the governor has to go to the Speaker, or a Speaker pro tempore if the House agrees a pro tempore can accept it. After the adjournment, the House continued to negotiate. According to sources, there was a deal made on a Speaker pro tempore and a way to ensure that House staffers could continue to come to work and get paid. But Jackson was not going to wait. Loose Units don’t wait. Jackson, likely at the suggestion of Representative David Eastman (R – Wasilla) went across the street to the Court House with Representatives Eastman and Revak, and some staff to have herself “sworn in.” LOOSE! So much for that oath to uphold the Constitution. The entire thing was posted on a now deleted Facebook Live video from Representative Josh Revak. The word spread fast. I went over to the Court House to figure out what just happened. They weren’t too happy about the stunt. Check out the legendary quote in a Juneau Empire story on the whole thing. Needless to say the stunt derailed negotiations in the House. The House floor session for later in the day was cancelled. There was speculation it was cancelled in part because they did not want to have the sergeant at arms remove Jackson from the floor if she attempted to enter. YES! Most people did not believe it at first. I was telling people at the governor’s press conference. They didn’t believe me until I showed them the video. Representative Gabrielle LeDoux (R – Anchorage) told me, “It’s the most bizarre thing I’ve ever seen.” Even the House Republicans put out a statement saying they appreciated her eagerness but they were going to wait for it to be done in accordance to Alaska Statutes and the Constitution. Damn. Jackson was eventually able to get confirmed and seated the next day once Representative Neal Foster was elected Speaker pro tempore. But damn, what a way to get there. I have a feeling she will be a great provider of content for the Landmine in the months to come. Putting Art Chance in charge of labor relations is like putting an arsonist in charge of fire prevention. You’re using much nicer words than ones I would have chosen.